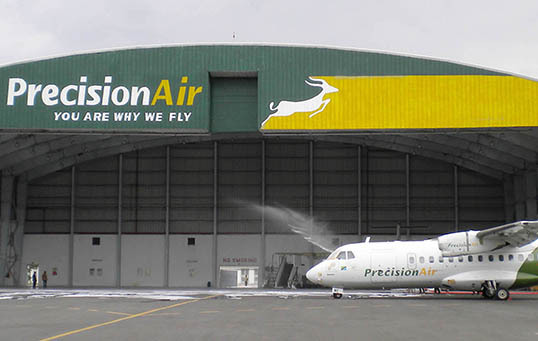 Precision Air Services PLC has launched an apprenticeship programme for young aircraft technicians as part of efforts to combat scarcity of licenced aircraft engineers in the Tanzanian market. The airline says the programme is also aimed at developing needed skills for its technical unit through field attachment, volunteering and apprenticeship. In the first intake of the programme, the company has recruited 22 candidates who will undergo on the job training at the engineering and maintenance department. Precision Air managing director Sauda Rajab said finding needed skills in the aviation industry in Tanzania is one of the biggest challenges, which the firm, as one of the industry players, cannot sit back and complain. “That is the reason we had to come up with the programme to help find solutions for the benefit of the industry. We are proud of our contribution in developing needed skills in the aviation industry in Tanzania. Our aim is to develop as many licenced engineers as possible to meet our skills demands and for the industry as well,” she said. She pointed out that it takes about eight years to develop a fully trained, licenced engineer. In 2017, the airline signed a skills development agreement with the National Institute of Transport to host students who pursue different courses at the institute for practical training, with the possibility of permanent employment based on their performance during the internship and apprenticeship programmes. So far Precision Air has trained a total of 33 interns since the inception of the programme.